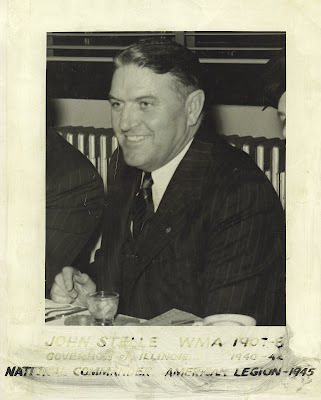 John Henry Stelle (born August 10, 1891 McLeansboro, Illinois - died July 5, 1962 St. Louis, Missouri ) was a U.S. political figure. He served as the governor of Illinois from 1940 to 1941. As Lieutenant Governor of Illinois, he naturally assumed the highest office in the state when Governor Henry Horner died. He attended Western Military Academy, and earned a law degree from Washington University in 1916. Stelle was a lifelong Democrat who served in World War I in the U.S. Army. He was a delegate to most of the Democratic National Conventions from 1928 to 1960. Stelle's first statewide office was as Treasurer, from 1935-37. From there, he moved into the spot of lieutenant governor in 1937, keeping that job until Horner's death three years later. Upon his death, Stelle's body was taken back to McLeansboro for a funeral conducted by the Gholson Funeral Home and laid to rest in the McLeansboro City Cemetery. The Stelle Mansion, one of the more notable buildings in town, caught fire and burned down in 2005, destroying one of the last remnants of Stelle's life.